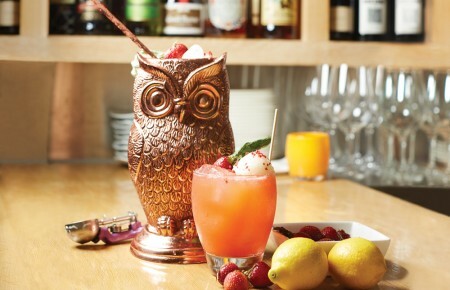 It’s time for a seasonal makeover—harvest style. 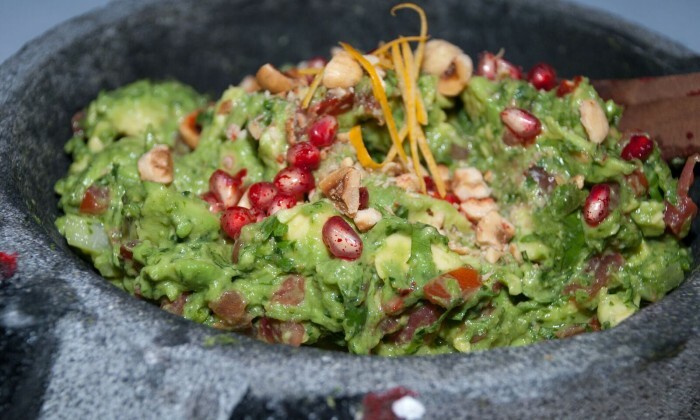 Add some crunch to your guacamole with Rosa Mexicano’s tangy twist. Toasted almonds, pomegranate seeds, roasted apples and pears bring texture, while minced jalapeños kick the heat up a notch. Preheat the oven or toaster oven to 350 degrees. Line a baking sheet with aluminum foil. Spread the cubed fruit on the baking sheet. Drizzle with the oil and toss to coat evenly. Roast for about 10 minutes until lightly browned on the edges and somewhat softened. Transfer to a mixing bowl. Meanwhile, combine 1 tablespoon of the onion, 3 tablespoons of the cilantro plus the jalapeño and the teaspoon of salt in the bowl of a molcajete or in a mortar and pestle to form a paste-like consistency. Transfer to the mixing bowl. Gently fold in the avocado, keeping it as chunky as possible. Add the tomato, the remaining 2 tablespoons of cilantro, the remaining tablespoon of onion, the pomegranate seeds and the toasted almonds; fold in gently. Taste and add salt as needed. Serve right away, or place a piece of plastic wrap directly on the surface of the guacamole and refrigerate for up to 3 hours. NOTE: Toast the almonds in a small dry skillet over medium-low heat for a few minutes, shaking the skillet to keep from scorching the nuts. The almonds should be lightly browned and fragrant. Cool before using.